More than 50 percent of people who start their organic vegetable garden give up even before they even make their, first harvest. Well, I could blame it on bottlenecks and de-motivating factors associated with such endeavors. Those negative factors point to a single thing – over-ambitious start with little or no groundwork. I will not lie to you that you will find it right the first time you try. However, I can assure you that with enough groundwork, you will grow progressively better until you become one of the best organic gardeners. This post aims to provide you with accurate and reliable information on the most important things to consider before starting your own organic vegetable garden. Keep in mind that an organic garden is not a usual garden. It means you have to foster a more holistic, natural ecosystem by avoiding any synthetic fertilizers or pesticides. Without venturing off our topic, let’s discuss 6 important things to consider in order to have an optimal start. The result will be healthier plants, fewer disease and pest problems and a more carefree organic gardening. Although you do not need a university diploma or degree in Agriculture, starting an organic vegetable garden does require some knowledge of the basic requirements of plants and veggies. Plants generally need sunlight, water (moisture) and air to grow in soil. However, the individual requirements of each plant may vary considerably. Besides, some plants and veggies only grow in cool or hot environments. You must determine the optimal environmental conditions necessary for your organic plants to grow fast and healthy. Most vegetables and fruits grow in direct sunlight. Only a few will grow in shaded areas. All plants need an adequate amount of water to grow. Therefore, you must situate the garden close to a water source. In addition to sunlight and water, plants need assortments of nutrients for healthy growth. Such nutrients include phosphorus, nitrogen, and potassium. Perform soil test. If your soil lacks these nutrients then you will need to add them manually. Plants obtain all these basic needs from the soil. The soil type in your area may favor some plants and not others. A few varieties of plants can grow in water without the soil (think of aquaponics and hydroponics). The golden rule is that you must grow an organic garden in well-drained soil. Do your research on the specific vegetables of your interest to decipher their basic requirements. The second most important consideration is the place to locate the organic garden. Your success will depend on where you situate your garden. Some plants can thrive in-house but the majority require full sunlight and therefore do well in an open location. If you grow plants in your house, they have the benefit of improving the quality of air in your house. Regardless of the location you choose, you must ensure it has well-balanced soil that has all the necessary nutrients, is well drained and has access to sunlight most of the day. You can still have an organic garden even if your location is not well drained by raised beds. If you have smaller spaces then you can maximize land usage by planting in containers. Garden plants are adapted to specific climatic conditions. To optimize their production, you must take into account the climatic conditions in your area. Some vegetables and fruits do well in colder climates while others are adapted to warmer conditions. Gather information about the seasons and the plants that will do well in those seasons. Majority of fruits and gardens will require a full year to finish their cycle. If you know about the climatic conditions in your area in relation crops you intend to grow, you will find it easier to plant in a timely manner. A wide variety of plants can grow in an organic home garden. If you go to a grocery market, you will find different herbs, vegetables, and fruits. There is very little chance that can grow all of them in your organic home garden. It means you must select a few that will grow best in your soil type and under the climatic conditions in your area. Concentrate on growing your favorite foods. My favorites that also do very well in most home gardens include oregano, pepper, and rosemary. Herbs such as basil or and pepper can grow in-house. To add some exterior décor and make your garden more beautiful, you can grow some ornamental plants alongside your food plants. A useful tip is to grow plants that complement each other (corn and potato). 5. Which Should You Choose – Plantlets Or Organic Seeds? According to my experience, most fruits and vegetables tend to grow very well from seeds. However, some home garden plants are notoriously difficult to grow. These can grow well from plantlets. Both organic seeds and plantlets are usually readily available in stores selling agricultural products. You will find the instructions on how to plant the seeds in the package. 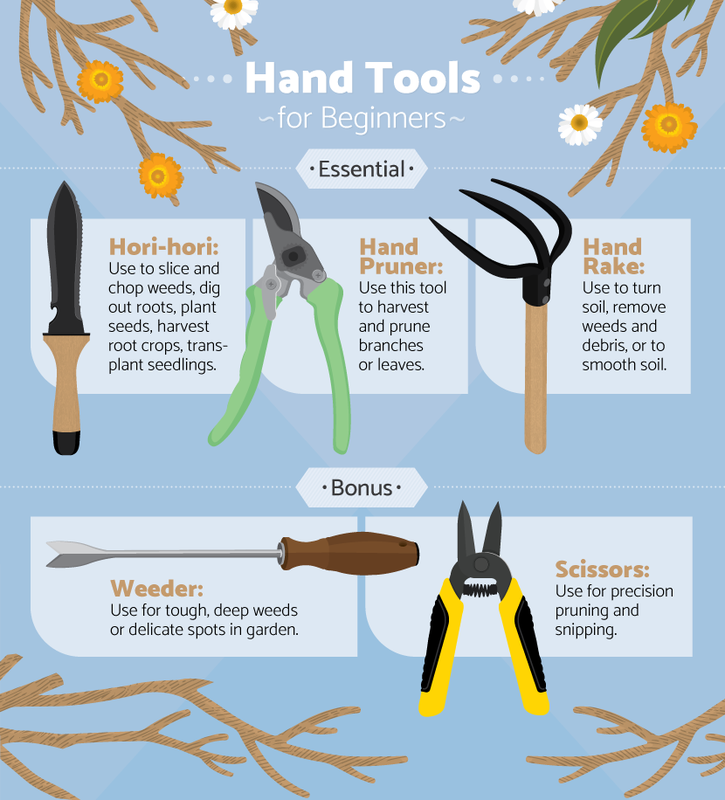 Gardening can be quite cumbersome and frustrating if you do not have the right tools for gardening. An important factor to consider when starting your own vegetable garden is the availability of essential gardening tools. In case you will plant in containers, the most important tools you will need include potting soil, a small trowel, and a watering can. Raised beds, on the other hand, will require a shovel, digging fork, hoe, watering hose and weeding tool. In many cases, an axe/splitting maul is required to cut big trees. If you will be working in a large garden, you will need rototiller for preparing the soil for seeds in addition to the other tools named for raised beds. Since you are starting an organic vegetable garden, you will be confined to using the only holistic and natural product as alternatives to fertilizers, pesticides, and herbicides. You can easily make organic manure by recycling plant and food waste. Planting an organic vegetable garden should not a difficult exercise especially if you gather yourself with the right information. From our discussion, sticking to the six factors can provide you with excellent results. This is not to promise you will get right the first time you try but it will increase your chances of getting a good yield from your organic garden. I hope you have found this resource helpful.